Umm an Nar lies just southeast of the main island of Abu Dhabi, and is now only separated from the mainland by a narrow channel. If you read "Looking for Dilmun" you will see that not so long ago it could only be approached with some effort; including using a boat. Things are much easier now, as after crossing the Muqtaa Bridge, it is possible to reach the site via the new flyover by the gas plant. The journey can quite easily be made in a two-wheeled drive vehicle. The site can be split into two distinct areas, one containing the tombs and the other the settlements. 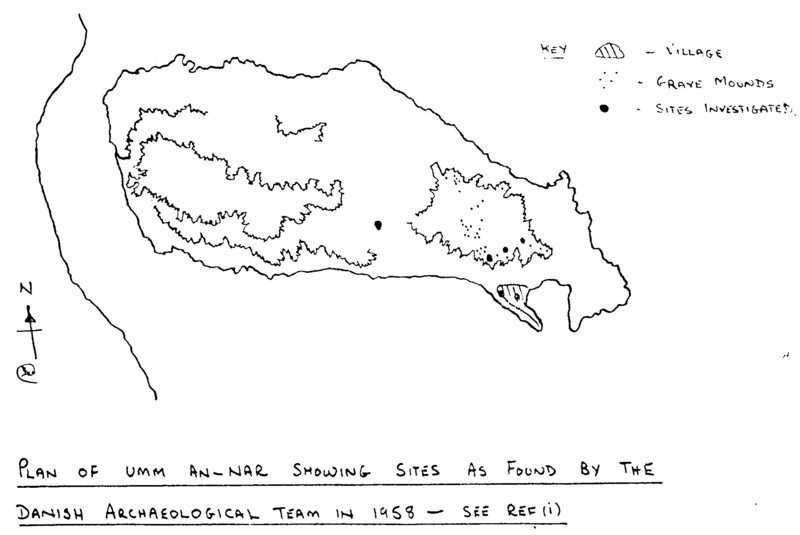 It is thought that the tombs were first ‘discovered’ by ADMA geologists whilst carrying out surveys around Abu Dhabi. In 1953 Mr. Temple Hillyard contacted the Danish Archaeological Team who were working in Bahrain and informed them of the tombs. In 1958 he arranged for a small team headed by Prof. P.V. Glob to carry out an initial survey. 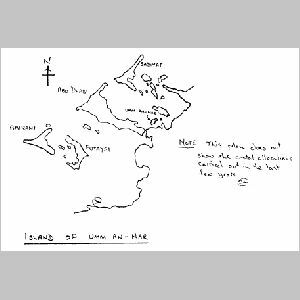 What they found encouraged them to enlarge their thinking about Dilmun and Makan, and to organize a series of digs on Umm an Nar from 1959 to 1965. Their findings were published in ‘Kuml’ Journal issued by the Danish Prehistoric Archaeological Society in Arhus of Denmark (ref iii). 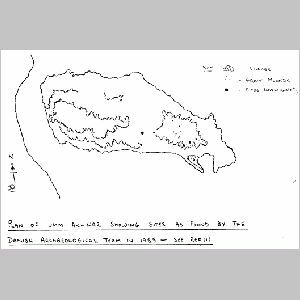 During this period of study, the positions of approximately 50 tombs were plotted and described with seven tombs and a settlement being excavated and studied in depth. 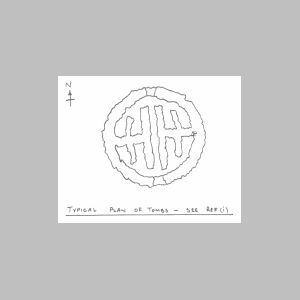 It was found that the circular tombs (some up to 12m in diameter) were made from an outer skin of limestone blocks, which had been cut and bonded to very fine limits. The inner skin of the tombs consisted of stones, thin slabs and roughly squared blocks laid in a random fashion. 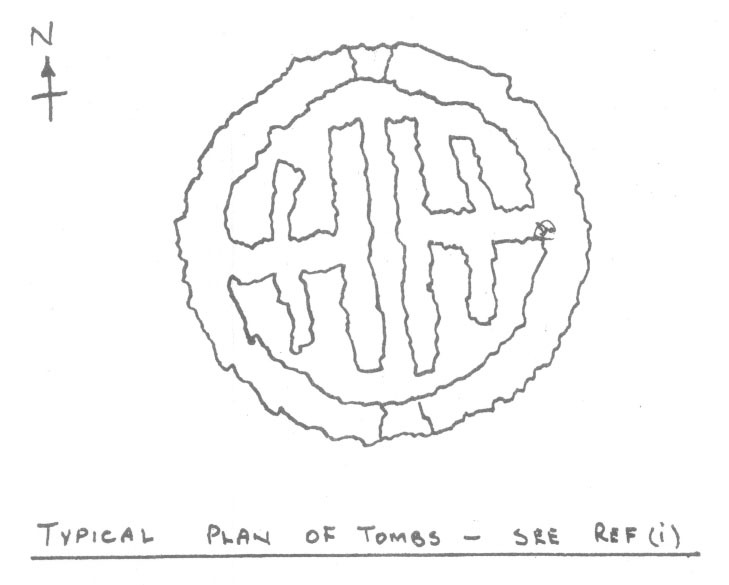 Most of the tombs contained inner chambers and had entrances on the north and south. Some of the entrances were flanked by carvings of animals such as a camel, an oryx and a bull. I do not know where these are at present but they but be very similar to the ones that can be seen at Hili and in the Al Ain Museum. When excavated, the tombs were found to contain human bones, a few copper (bronze) items, and two types of very fine, wheel-made pottery. 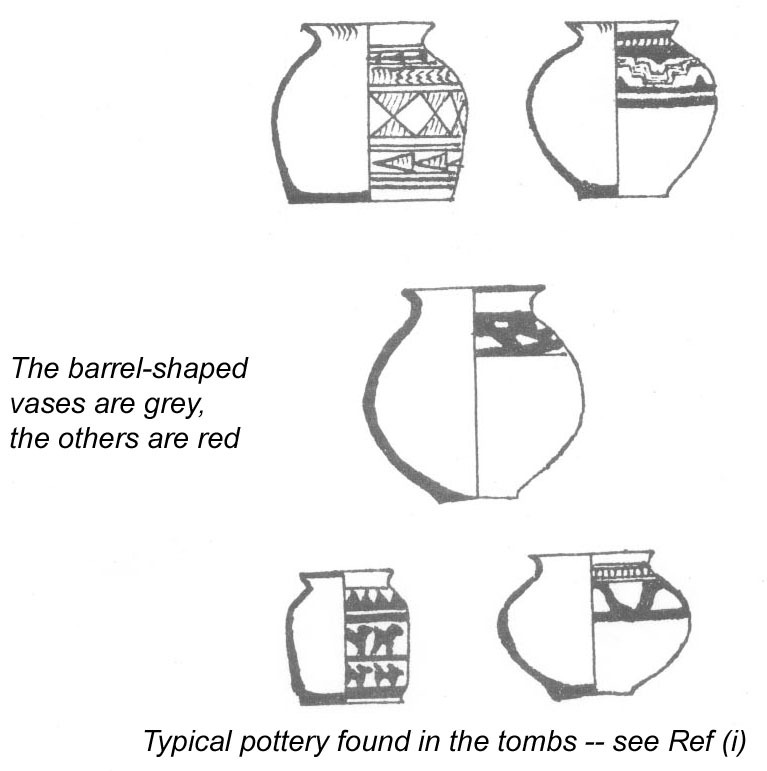 This pottery, which is either red or gray and is often painted and incised, showed connections with the Kulli civilization and with Bampur V – VI (see ref. I). When the team switched their excavating to the settlement, they uncovered a very well constructed house that has a floor plan of some three hundred square yards and contains seven rectangular rooms each 10 feet wide by up to 35 feet wide. Geoffrey Bibby comments in his book (ref I) ". . . we had to revise our opinion of the rude fisherman of prehistoric Abu Dhabi. This was a finer house than any in contemporary Abu Dhabi, except the Sheikh’s palace itself . . ." Items found while excavating the settlement included: copper fishing hooks; limestone line/net sinkers; sherds of pottery the same as found in the tombs; a much thicker and coarser ‘everyday’ type of pottery; sections of a quern stone (used for rubbing grain); a bone spindle – whrol (used for spinning); and animal bones. 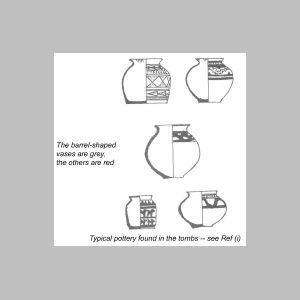 The pottery found confirmed that the inhabitants of the settlement were the tomb builders and an date of between 2700-2500 BC was given to the site. The animal bones proved to be very enlightening for they included, as would be expected, fish bones but few goat, sheep or cattle, although a great number of camel and gazelle. The biggest surprise, however, was the fact that about 80% of the bones turned out to be of Dugong (see Bulletin No. 1). When Professor Colin Bertram visited the area in November 1976 he found some Dugong bones lying on the surface. These he subsequently brought along and showed our Group in the course of his talk on the Dugong. The Danish team left Abu Dhabi in 1965 and were followed by an Iraqi team in the early 1970’s. They have subsequently excavated and "restored" more of the tombs and further sections of settlements. It would be nice to know the true story of Umm an Nar. 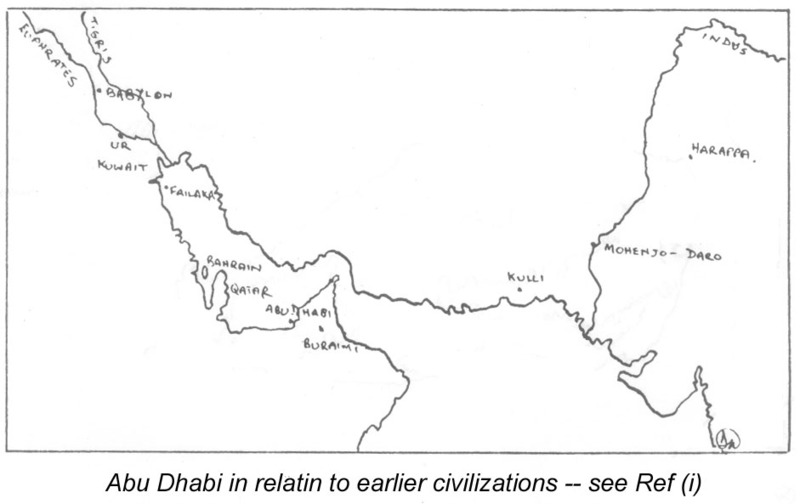 Did it come into being due to civilization spreading from Dilmun (Bahrain) or the Indus region? Or was it a sea port for Makan? Whatever the answer is, one thing is certain – the climate of the region during the time in question must have been very different to that of today’s, or else how could the people have survived and built such fine structures without fresh water? Also of interest, though of a much later age, is the ‘cistern’ that can still be seen to the south of the restored tombs. Skeikh Shakhbut told Geoffrey Bibby that it was constructed during his grandfather’s days and was used to collect the rainwater that fell spasmodically, and that people used to row over from the mainland to collect and use it. The inscription is said to read, "Allah the Compassionate the Merciful." One last point. When Professor Glob visited the site in 1958, he found several flint flakes lying on the surface of the ground. These date long before 2700 BC and would lead one to think that maybe there is a still earlier settlement site to be found somewhere in this region.